Editor’s Note: In an interview with the Liberty Champion, Jerry Falwell answered questions about some of the controversial issues regarding his personal support of Donald Trump for president. Liberty University does not support or oppose any political candidates. Beginning as a multiple year friendship with Donald Trump, Falwell’s personal connection with Trump has transformed into a political backing for the upcoming presidential election. Falwell said his friendship with Trump began when Trump first spoke at Liberty in September 2012. Falwell said he kept in contact with some members of the top management of Trump’s company and has recently had the opportunity to get to know Trump’s family. Falwell said he has been focused on running the university, but he did spend time on the campaign trail with Trump during the weekend of the Iowa caucus. Falwell said he was not expecting what Trump would later ask him to do. “I showed up (at) an auditorium packed with thousands of people,” Falwell said. A university president and lawyer by trade, Falwell said he asked for some help before moderating. 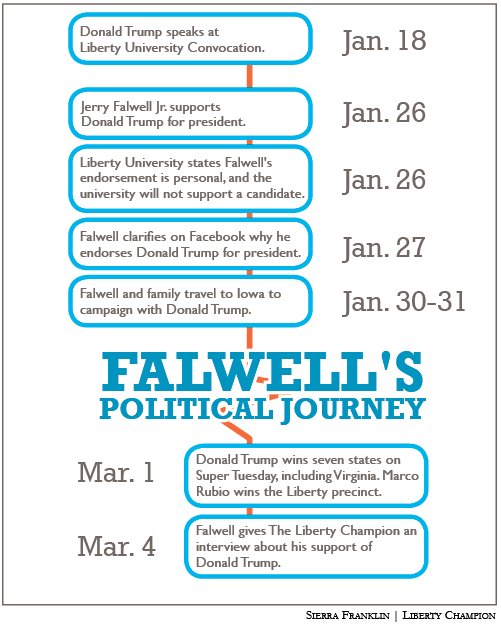 Trump then asked Falwell to stay the night and follow him on his campaign stops for the next day. Falwell said he was impressed by Trump’s hospitality on the flight. Falwell said he and his family followed Trump to Council Bluffs, Iowa and Sioux City, Iowa where he moderated for Trump before coming back to Lynchburg. “It was an experience of a lifetime, but it was a lot of fun,” Falwell said. According to a statement released by Trump’s campaign in January, Falwell acknowledged why he chose to support Trump. “(Trump) is a successful executive and entrepreneur, a wonderful father and a man who I believe can lead our country to greatness again,” Falwell said in the statement. Falwell has continued his support of Trump because he believes Trump is the businessman and not the politician the U.S. needs to be restored to a healthy condition. Falwell said he believes recent remarks in opposition of Trump are conditioned politicians scared of change. Falwell emphasized the importance of the fact that Trump has not held elected office before. Falwell, who was working for Liberty during its early financial struggle, said he admires Trump’s business skills. He thinks Trump’s skills will translate into an ability to help the U.S. recover from its almost $20 trillion debt. Trump has taken some opposition from religious leaders who remain in disagreement with his policies. According to CNN, Pope Francis said Trump “is not Christian” if he wants to build a wall between the U.S. and Mexico and deport undocumented immigrants. However, Falwell said he thinks evangelicals should think about elections differently this time around. He said saving the country from terrorist attacks, runaway debt and open borders has to be the first priority. “All the other issues will be moot if we don’t save the country,” Falwell said. Despite disapproval by some Liberty alumni and others in the community, Falwell believes Trump gives America the best chance to be great again. “It is sad to see Christians attacking other Christians because they don’t support the same candidate or the candidate who they believe is the most righteous,” Falwell said. Because of Falwell’s position at Liberty, he had the university release a statement Jan. 26 stating the university does not endorse or oppose political candidates. It also said Falwell’s choice to endorse Trump is a personal choice and not a decision as the role of university president. Liberty cannot legally endorse a candidate for presidency and keep its nonprofit, tax-exempt status as a university. Falwell also addressed the rumors that contributions were made so Falwell would support Trump for president. Liberty students came out in full force March 1, the presidential primary in Virginia. Students cast 1,215 votes at the Vines Center with 90 of them for Trump. Though Trump did not win the Liberty precinct, Falwell said on Twitter that he was “proud of @LibertyU students for voting their conscience today and thinking for themselves unlike those at many univ who blindly follow admin.” He said students need to vote in the November presidential election. Falwell continued to emphasize the necessity of students to fulfill their responsibilities as Americans. Rodriguez is the news editor. A vote for trump is a strike against you from my father in heaven. So let it be written.